A wormhole is an extradimensional conduit between two distant points in space. For example, in Star Trek: DS9, there is a wormhole which connects two different quandrants of the galaxy. The idea behind a wormhole is that space has more dimensions than the three we observe and experience. Consider two points on a piece of paper. The piece of paper is a two-dimensional area. The two points may be very far apart on the piece of paper, but someone can fold the piece of paper so that these two points are near each other in three-dimensional space. Likewise, three-dimensional space could be folded in such a way that two points which are far apart in ordinary three-dimensional space are brought together in some kind of extradimensional space. Wormhole Chess brings the idea of wormholes to the Chess board. When a piece moves, it folds the space it just moved from out of regular space. As a consequence of the fold, spaces which were connected by the space are brought closer together. Pieces move across the folded space as though it is no longer there, and the spaces which it directly connects to each other are now adjacent. This allows limited-range pieces to move across the Chess board more quickly. Champions replace Rooks, Wizards replace Bishops, and a Murray Lion replaces the Queen. Whenever a piece moves, the square it moves from is removed from the game. Any remaining squares which are connected by one or more removed squares are considered to be adjacent. When a piece moves, it passes over removed squares as though they are not there. For example, if there are some removed squares in front of a Pawn, the Pawn's move takes it to the square immediately after the removed squares. When a piece leaps two or three spaces, its move can be altered by removed squares on each step of its move. The only squares which count in a move are the remaining squares. Pawns may not capture each other by en passant. There are other differences from FIDE Chess, which are implied by the rules rather than contained in them. Knowing these will help give you a better sense of the game. The game can last no longer than 32 turns. Short-range leapers can sometimes move as far as the other end of the board. Colorbound leapers, such as the Wizard, are no longer colorbound. An attack can sometimes be stopped by removing a square in the path of the attacking piece, thereby changing what squares it can move to. Removing a square can cause a piece to attack squares it wasn't attacking before. This should be kept in mind as a tactic you can use against your opponent and as a danger to watch out for. The long-range Chess pieces have been replaced with limited-range leaper pieces. At the beginning of the game, the new pieces all defend the same Pawns which the orthodox chess pieces defend. Champions replace Rooks, Wizards replace Bishops, and a Lion replaces the Queen. The King moves as the King in FIDE Chess, except that it never has any opportunity to castle. It moves one space in any direction, but may not move into check. The Murray Lion moves as an Alfil (Elephant) or Dabbabah (War Machine), and it may capture (but not otherwise move) as a Ferz or Wazir. It leaps two spaces in any single direction, jumping over any intervening pieces. It may also move one space in any direction, but only to capture a piece. The Murray Lion was inadvertantly invented by H.J.R. Murray, who made a mistake in recording how the Lion in Chu Shogi moves. The Wizard can move as either a Ferz (General) or a Camel. It can move one space diagonally, as a Ferz does, or it can move two spaces in the same orthogonal direction and one more space in an outward diagonal direction, as a Camel does, jumping over any intervening pieces. The Wizard was invented by Daniel C. MacDonald for Omega Chess. The Knight moves as a Knight in FIDE Chess, one space orthogonally, then one space in an outward diagonal direction, jumping over intervening pieces. The Champion may move as a Wazir (Vizir), Dabbabah (War Machine), or Alfil (Elephant). It may move one space orthogonally, or it may leap two spaces in any single direction, jumping over any intervening pieces. The Champion was invented by Daniel C. MacDonald for Omega Chess. The Pawn moves as a Pawn in FIDE Chess does, except that there is no en passant. It moves one space forward without capturing, and it moves one space diagonally forward to make a capture. It may move forward two spaces on its initial move, but there is no en passant capture. Since missing spaces may extend both double moves and Pawn captures, keeping en passant capture could have made the game overly complicated. On reaching the last rank, it may promote to a Murray Lion, a Wizard, a Knight, or a Champion, but reaching the last rank is possible only by capturing a piece. Merely reaching the last space left on a file does not enable a Pawn to promote. Likewise, Pawns do not get to promote when other pieces remove all the spaces in front of them in their file. All of the pieces can move through wormholes. A wormhole is any removed square or any line of removed squares which connects together two of the remaining squares on the board. When a piece enters a wormhole, it continues on in the same direction until it's no longer in a wormhole. This holds for each step of a piece's move, not just if it happens to land on a wormhole. So Knights, Champions, and Lions might pass through two wormholes on a single move, and a Wizard might pass through three wormholes on a single move. To give you a better understanding of how wormholes affect how pieces move, look at this diagram of a checkmate. Black has checkmated White with the Knight at e6. The Knight move is redirected by the void on c5, the space it would normally be able to land on, to the King at b4. The Knight's move goes orthogonally from e6 to d6, then diagonally from d6 to c5. Since there is a void at c5, it continues diagonally to b4. The King cannot move to any space backwards and to its left, since those spaces are all gone. The spaces the King could escape to are covered by various pieces. The Pawn at c4 covers b3, and the Pawn at d5 covers c4. The King at e8 covers a4. The Lion at d8 covers a5. The Pawn at a7 covers b6. The Lion at d8 and the Pawn at e7 both cover d6. I'll use the same diagram to highlight how other pieces move. And for this I'll pretend that either player could move and there is no checkmate in effect. The White Knight at h4 is attacking the Black Pawn at d5; and the Black Lion at d8, the Black Knight at b8, and the Black Pawn at b7 are all defending it. And wormholes are making it possible for each one of these pieces to reach this square. The wormhole from g4 to f4 extends the orthogonal part of the Knight's move. The wormhole at d7 extends the Lion's orthogonal two-space move. And the wormhole at c6 extends the Pawn's diagonal capture and the diagonal part of the Knight's move. The Black Wizard at c8 would be defending d5 if there were no wormholes on the board, but the wormholes are instead directing its attack to the Lion on the other side of the board at d1. Wormhole Chess can be played with a regular Chess set or preferably with an Omega Chess set. The set for Omega Chess comes with Champion and Wizard pieces. If you don't have an Omega Chess set, use Rooks for the Champions and Bishops for the Wizards. In either case, use a Queen (or maybe an upside-down Rook) for the Lion. When a piece moves, you can mark a square as no longer in the game by putting something like a poker chip or a checker on that square. Regular algebraic Chess notation can be used for Wormhole Chess. The removal of spaces does not have to be noted separately, since it is implicitly understood that any square a piece moves from is removed from the game. Use C for Champion, W for Wizard, and L for Lion. Aside from the use of different pieces, the only thing which should distinguish the notation of Wormhole Chess from the notation of FIDE Chess is that pieces will sometimes make moves which are impossible in FIDE Chess. The concept behind Wormhole Chess is the sort of thing João Neto calls a mutator. It can be applied to just about any Chess variant to create a new Wormhole variant. The original Wormhole variant uses the FIDE pieces. Line-rider pieces, such as the Bishop, Rook, and Queen, move as they usually do but may not land on removed squares. Because they can normally move across the board and do not change directions while moving, removed squares have less effect on their movement than they have on the pieces I chose for the main variant. This game won second place in the 32 Turn Challenge. Thanks for the clarification about Pawn promotion. As I've programmed the game for Zillions-of-Games, promotion is possible only when a Pawn reaches the last rank by capturing a piece. I don't find any information about Pawn promotion in Wormhole Chess. Do Pawns promote on the last square they can reach, whatever the rank (for example if there are no squares anymore vertically in front of the Pawn, beyond the wormhole, nor diagonally where an opponent's piece could land)? Or do they only on the last rank, meaning that if a Pawn can't reach the 8th rank anymore, because of the disappearing of squares, he can't promote anymore? This comment gives me the opportunity to rate this game as 'excellent'. Really great concept and gameplay. It would be great to have a larger variant of Wormhole Chess, 10x10 or even 12x12. Another cool concept for a variant from Fergus. 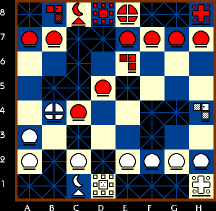 I wish that there was a "Leaper Chess" with this board layout and pieces, but without the wormholes. That could be interesting.